This work, by William Douglass (who helped initiate the Basque Studies Program at the University of Nevada, Reno) and Jon Bilbao (author of several Basque reference works), is the most accessible overview of the Basque diaspora in the Western Hemisphere. 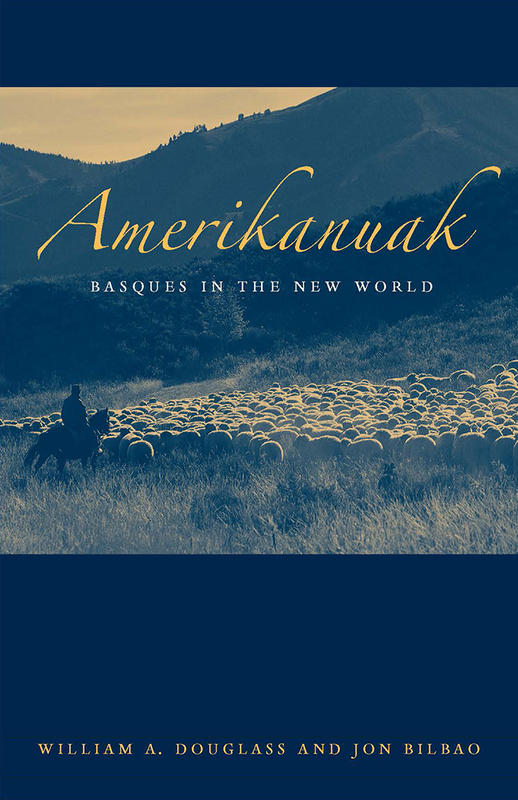 Amerikanuak is a pioneering study of one of the American West’s most important ethnic minorities, an engaging, comprehensive survey of Basque migration and settlement in the Americas, and an essential introduction to the history of the Basque people and their five centuries of involvement in the New World. Research for the book took the authors through ten states of the American West, Mexico, Colombia, Peru, Chile, Argentina, Brazil, and Venezuela as they traced the exploits of Basque whalers in the medieval Atlantic, the Basque conquistadors, missionaries, colonists, and sheepherders who formed a dramatic part of the history of Spanish America. They also follow the story of the Basques back to their mysterious origins in prehistory to provide background for understanding the Basques’ character and their homeland in the Pyrenean mountains and seacoasts between France and Spain. This is a revised and updated edition of the original 1975 publication. New preface by William A. Douglass. William Douglass helped to initiate the Basque Studies Program (now Center for Basque Studies) at the University of Nevada, Reno, and served as its coordinator for over thirty years. He has published several books and articles about Basques, Basque culture, and Nevada history. Douglass was inducted into the Nevada Writers Hall of Fame in 2012. Though he is now retired, Douglass still studies and writes about Basques and Basque culture. Jon Bilbao prepared the massive Eusko-Bibliographia, a bibliography of Basque reference works. He was also an instructor with the Basque Studies Program at the University of Nevada, Reno. "Though the distinguished authors . . . modestly claim to have done no more than make a preliminary exploration of the subject, their treatment is likely to remain the standard for a considerable time." "The scholarship, narrative, and sources cited make this book required reading for students, genealogists, and scholars interested in the Basque experience in the New World." "Amerikanauk is an impressive volume. Its superior bibliography attests to the depth of their work. This insightful and mature book deserves a wider circulation than it will probably receive."